There have been a number of articles printed as well as interviews on radio about the 100 degree turn in the weather. This time last year, we were baking under no rain and 90s. This year, farmers are saying we've had adequate moisture and perfect temperatures. Crops could be a week later for harvest than usual but, for the most part, this has been an ideal growing season, so far. The flowers on the deck bear witness to this. 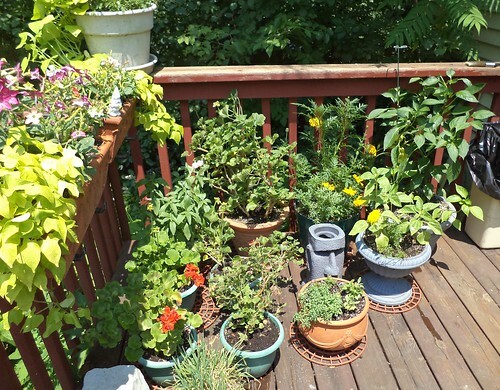 With the long weekend upon me, one of the tasks on the list was to rearrange the pots on the deck. Some of the low growing flowers were being completely screened by the taller ones. I'm looking at you, marigolds. Two feet tall and still growing? Seriously? I don't remember reading that on the little plastic stake in your pot when I bought you. Plus, all manner of weed had sprouted in the containers, thanks to the nice, fresh, new potting soil I used this year. Those had to be pulled. And I spent time deadheading some of the flowers so there will be fresh flowers in a week or so. Here is the deck looking north. I moved the white container which has a sweet potato vine to the corner of the deck rail. 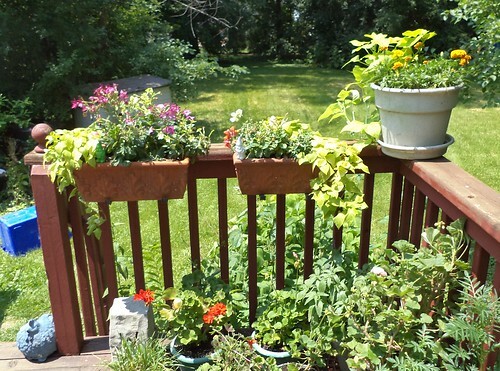 The vine can hang down that corner of the deck and not be in any other plant's way. Plus, the short marigolds in it were being screened from sunlight by the now gigantic pink geranium. Man, repot that in fresh soil and it's gone bonkers; all lush and green and tall. I thought I had killed the salmon colored ivy-leaved geranium. It's at the bottom middle of the above photo, in the green pot. I found it sitting in water and had to tip it over to allow some of the water in the pot to run out. It looked so sad. But, it has rebounded and had one salmon flowerette on it. Most geraniums are difficult to kill, which is one reason I like them, but it looked so sad in June. Here is the deck looking west. The hanging boxes can often be problematic in keeping nice. They dry out so quickly. The nicotania and sweet potato vines seem to be exceptionally happy. The other thing I did was repot my ancient spider plant. Usually, this is inside but it looked so bad, so very bad, that I moved it outside to try to rejuvenate the plant and then to repot it, after I bought a bag of potting soil since I'd used up what I had on hand in planting this year's flower crop. I realize I didn't take any before photos but, trust me, you would have revoked my plant growing credintials and taken all my other plants into foster care if you had seen how bad this one looked before repotting. 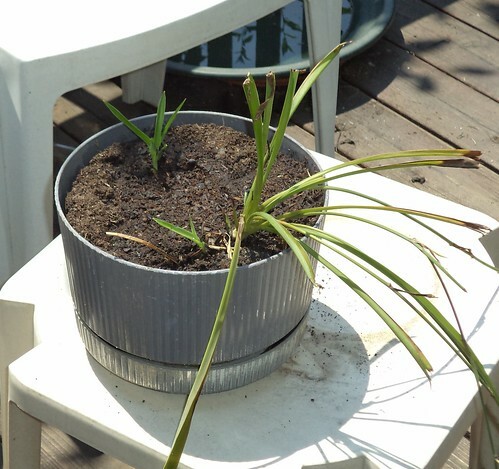 Spider plants like to be pot-bound. I don't know how long I've had this particular plant; years. The roots were all over the bottom of this pot. You see how the leaves on the bigger plant are torn? That's the fault of the cats. They will jump up on the table in the living room and chew on the leaves. If I catch them, they are told to get down, but I don't always catch them in the act. Spider plants are not good for cats to chew on, either. So, now that this is repotted, I'm going to leave it outside for a week for it to get used to being in new soil. Then I will bring it back inside where it stays. I expect some adjustment but soon it will look happy and healthy again. My deck green space is quite inviting. I rather enjoyed sitting there after rearranging it; enjoyed it so much, I fell asleep. That also could have been due to the warmth of the sunshine on a summer's day.